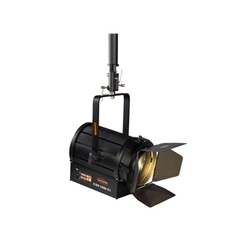 Pioneers in the industry, we offer 200w led fresnel spot day light, 200w led fresnel spot warm light, 250w led fresnel spot color tunable, 400w led fresnel spot day light and 400w led fresnel spot warm light from India. Power Supply: 100-240V AC, 50-60Hz. 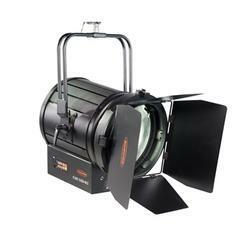 High-quality Canara LED Fresnel light used as a Keylight, Backlight, Fill light with dimming, spot & flood focus versions for creating various effects for multiple applications. 200W LED equivalent of 1000W Halogen. Brightness is controlled through DMX mode and Manual mode and integrated dimmer enable smooth dimming from 0 to 100%. The temperature of the lighting fixture is controlled by the active cooling system and it's having uniquely designed heat sink. Aluminum dies cast and extrusion sheet housing with 7 tank Rusto cleaning, black powder coat mat finish paint. 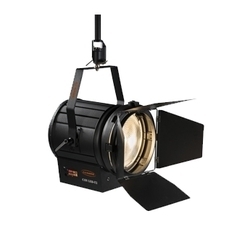 High-quality Canara CCT tunable LED Fresnel light used as a Key light, Backlight, Fill light with dimming, spot & flood focus versions for creating various effects for multiple applications. 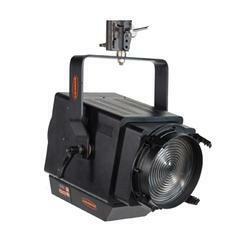 Color tunable 250W LED Fresnel from 2700K to 6500K color temperature. Temperature is controlled by an active cooling system having uniquely designed heat sink. Fabricated sheet housing with 7 tank rust cleaning, black powder coat matte finish paint. Delivers uniform field across the entire beam from spot to flood. Pole operated manual zoom control. Silent operation, fan noise < 20dB. 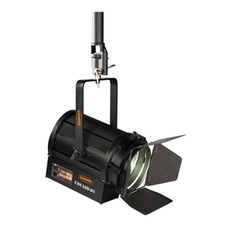 High-quality Canara LED Fresnel light used as a Key light, Backlight, Fill light with dimming, spot & flood focus versions for creating various effects for multiple applications. 400W LED equivalent to 2000W Halogen. Temperature is controlled by the active cooling system having uniquely designed heat sink. Aluminum dies cast and extrusion sheet housing with 7 tank rust cleaning, black powder coat matt finish paint. Aluminum dies cast and extrusion sheet housing with 7 tank rust cleaning, black powder coat mat finish paint.